Recloseable plastic bags are a highly sought-after form of plastic packaging due to their versatility and dependability. Bags that can be reclosed ensure that its contents are not only sealed off from outside elements, but that they also stay inside the bag and not leak or spill. Manufacturers make recloseable bags from varying materials such as nylon, canvas, and cotton. However, they are most commonly manufactured from plastic, specifically low-density polyethylene. The polyethylene plastic is melted down to a point where it is pliable, and is poured into a mold of the desired shape of the bag. Depending on the type of seal intended for the bag, a stronger, thicker piece of plastic may be fixated at the top of the bag. Recloseable Plastic Bags – Multi-Pak USA, Inc.
One common type of seal is a set of grooves on the bag that connect together like two puzzle pieces. One track locks into the other, fastening the bag shut. If closed properly, the seal should have to be tugged apart to be opened again, and the bag can be held upside down without its contents leaking or spilling. This goes to show that this type of seal is durable enough to prevent leakage both into and out of the bag. Another commonly found seal is the zipper closure seal, which consists of a small plastic sliding zipper that pushes the two lips of the bag closed. A third type of seal is the drawstring, which enables the bag to be easily opened and closed with the loosening and tightening of a cord. The cord can also be doubled as a handle, allowing the bag to be carried more easily than its zipper sealed counterparts. However, drawstring bags are less versatile than zip lock bags when it comes to the contents that they can store. A wide variety of features may be added to recloseable bags. 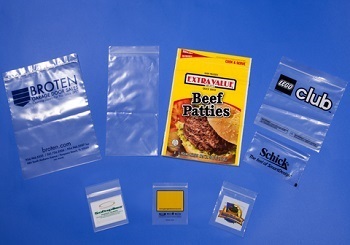 For medical or pharmaceutical zip bags, biohazard and drug labels may be added. Sensitive electronic components can be contained and kept safe in anti-static pink bags that have a thin layer of electrostatic dissipative (ESD) coating. Bags may be colored a dark amber to protect items from UV radiation. Additional features include bubble cushioning for fragile items, and tamper-evident seals. Recloseable bags are inexpensive and easily accessible, but not all recloseable bags are created equal. Understanding the requirements of your application is crucial in searching for the right type of recloseable bag. Different manufacturers have varied capabilities in making recloseable bags, and some may specialize in certain industries. Fortunately, IQS Directory lists a multitude of experienced recloseable bag manufacturers that serve a broad range of markets. In browsing the category on our site, you will be sure to find the bag that suits your needs. Recloseable Plastic Bags Recloseable plastic bags are a highly sought-after form of plastic packaging due to their versatility and dependability. Bags that can be reclosed ensure that its contents are not only sealed off from outside elements, but that they also stay inside the bag and not leak or spill.